In commemoration of the start of WWI, August 4, 1914. By Starr J. Sinton, Museum volunteer, CFB Esquimalt Museum. Just days before the outbreak of World War One, in the summer of 1914, British Columbia was offered a unique chance to make a substantial contribution to the defence of Canada’s vulnerable West Coast. CC1 and CC2 in port at Esquimalt, British Columbia. On the same day war was declared – 4 August, 1914 – Sir Richard McBride, Premier of BC, gambled his political future on a daring plan. The scheme was to spirit away two newly constructed submarines, originally intended for the Chilean Navy, in complete secrecy and under cover of darkness from Seattle, Washington. Not only was this a violation of US neutrality, but the Premier risked over a million dollars of provincial funds to obtain the much-needed vessels for defence of the West Coast. When war broke out, Canada’s West Coast found itself nearly defenceless. Great Britain immediately concentrated its great fleet in European waters for the struggle against Germany, leaving the northern Pacific largely to the protection of its ally Japan. Only one Royal Canadian Navy (RCN) ship lay in harbour at the RCN’s only West Coast base, Esquimalt, BC: the ageing cruiserHMCS Rainbow. At least one, and probably two, modern German cruisers were off the West Coast of Mexico. The cruisers were in a position to threaten British sea lanes in the Pacific, attack Nanaimo’s coal mines, shell Vancouver or Victoria with their long-range guns, or even destroy BC’s fishing fleet. With a declaration of war less than a week away, fate took a hand in the person of Mr. J. V. Paterson, president of the Seattle Construction and Drydock Company, who was in Victoria on business. At Victoria’s Union Club, Mr. Paterson mentioned two submarines his company had just finished and the troubles he was having with the Chilean government over payment. Soon he was offering the two submarines to Canada, at an almost 50 per cent increase in price over the previous deal brokered with Chile. BC’s premier Sir Richard McBride was soon informed. An avalanche of telegrams ensued, involving Victoria, Ottawa, and London, but little could be accomplished in the few days remaining before the imminent outbreak of war and a resulting American embargo on the provision of war materials to combatants. In this crisis, McBride took a courageous decision to use provincial funds to get possession of the much-needed submarines before it was too late. On his own initiative he decided to advance the purchase price demanded, just over $1.1 million. This was an enormous sum, twice the annual budget for the entire RCN for 1913-1914. On the day war was declared, Captain W. H. Logan, a surveyor for the London Salvage Association, was in Seattle to negotiate a deal, but the price remained firm, and an additional obstacle arose: payment must be cash on delivery. With no time left, Premier McBride by telephone promised a BC Treasury cheque would be waiting at the border at dawn the next day. Accordingly, at 10 pm that night, the two submarines, with both Captain Logan and Mr. Paterson aboard, put off silently through the fog and mist of Seattle harbour for a secret rendezvous off Trial Island at daybreak the next morning. 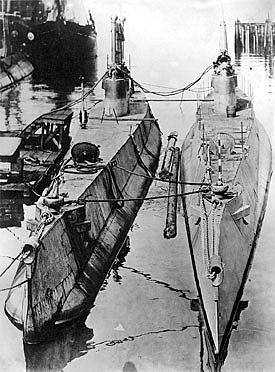 Complete secrecy was essential; both the Chilean and German governments would do all in their power to stop the sale of the submarines to Canada. BC’s representatives, in the steamer Salvor, were at the rendezvous point at dawn when the two submarines emerged from the mist. No time was wasted in beginning the agreed hour-long inspection of the boats, but since the Chileans had earlier complained about weight and endurance issues, the investigation lasted four hours. Captain Logan spent these hours combing the horizon for US Navy patrol vessels, while Mr. Paterson paced the deck nervously. If intercepted, the Seattle shipyard executive would have had a great deal of explaining to do, since he had taken the submarines out of port without any clearances and delivered them to a combatant power in violation of American neutrality. After four suspenseful hours, the cheque was handed over to a greatly relieved Mr. Paterson and the White Ensign was raised over British Columbia’s new naval vessels, which proceeded at speed towards Esquimalt. Even safely within Canadian territorial waters, however, the drama of the day was not yet over. Amidst all the haste and secrecy, only the Navy’s Dockyard was aware that two warships would be arriving in Victoria Harbour. Seeing two submarines approaching Victoria on the second day of war, a picket boat sounded its siren and raced into harbour, under the protective guns of the Army’s Coastal Artillery. 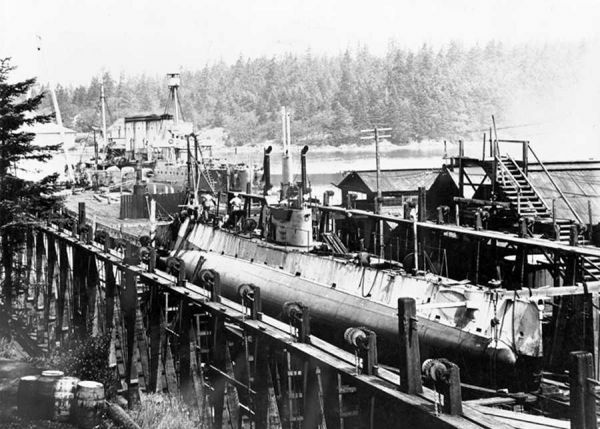 Fortunately, the shore batteries contacted the dockyard before giving the order to open fire, and the two submarines proceeded safely to their new home at Esquimalt. The two vessels were informally christened the McBride and the Paterson. They were taken over by the Government of Canada two days later and renamed, rather more anonymously, CC-1 and CC-2. Premier McBride soon received reimbursement for the provincial funds advanced for the purchase, and Mr. Paterson received a personal commission of $40,000 on the unorthodox sale of the RCN’s first submarines. What Sir Richard McBride did in those days of great anxiety, even distress, and what he accomplished deserves the commendation of his fellow countrymen. For his motives were those of patriotism; and his conduct that of an honourable man. transfer to the east coast was for both submarines of this class, with their mother ship, the submarine tender HMCS Shearwater. Its transit through the Panama Canal was the first time a Canadian warship transitted the Panama Canal under the White Ensign. It arrived in Halifax for preparation to send the two subs to the Mediterranean and Europe. Deemed unsafe for transatlantic crossing, the submarine was held in Halifax as a Training Assistance Boat. Her veteran crew were highly valued but were not able to conduct any other operations than training. Her continued use was too expensive, and her unseaworthiness resulted in her being paid off, and disposed of in 1920.